Kohei Miyadai pitches on April 16 at Jingu Stadium in Tokyo. 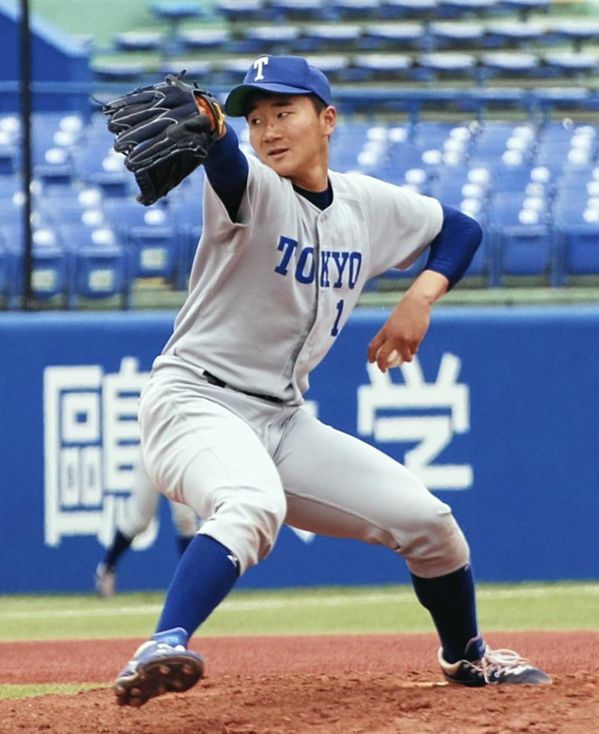 While the University of Tokyo rarely has much impact in the Tokyo Big6 Baseball League, one pitcher has been turning heads this season with performances not seen in decades at the prestigious, academically-elite school. Kohei Miyadai, a junior left-hander, posted Tokyo’s first shutout in 11 years when he blanked Rikkyo in a 4-0 victory on Saturday. It was his first win this season, and just the second for Tokyo — the most for the school since the 2008 autumn season. Miyadai, who is studying law, took the historic victory in stride. “It’s just a normal thing to do. I want to do something more difficult,” said Miyadai, who gave up five hits and had eight strikeouts, including three straight against the meat of the Rikkyo order in the sixth inning. The southpaw made a quick impact at the beginning of the spring season. In his first two starts, against Waseda and Meiji, he held both opponents scoreless through eight innings — only to lose both in the bottom of the ninth. Against Waseda on April 9, Miyadai kept the opposing hitters at bay with a fastball that topped out at 145 kph and seemed to rise just before reaching home plate. He chalked up 13 strikeouts, breaking a team record that had stood for 70 years. A week later against Meiji, he had just four strikeouts, but the fastball helped him get out of several jams. “I feel like my overall level is improving,” Miyadai said after the game. Miyadai, who stands 1.78 meters and weighs 82 kilograms, is a graduate of Kanagawa Prefecture’s Shonan High School, which is known for sending students to top academic universities. He was tapped as a future ace soon after he entered Tokyo. With each pitch he threw, he built up experience, leading to his first Big6 League victory by beating Hosei during last year’s autumn season. As he has also built up his stamina, this season Miyadai finally got the opportunity to throw a complete game. With a whip-like motion, he can repeatedly hurl fastballs that frustrate many an opposing hitter. Even opposing managers cannot hide their surprise. “We can’t get a hit off someone that good,” said Waseda manager Hiroshi Takahashi. “His pitches are not good — they’re outstanding,” said Meiji manager Tatsuya Yoshinami. In April, Miyadai pitched against Meiji on just two days rest, as Tokyo had a chance for its first series win since autumn 2002. (In the Big6, a team gets one point for winning a best-of-3 series). But his pitches were flat, and he gave up three runs in three innings and was the tagged with the loss. Interest is high in how much impact he can have for the rest of the season and beyond.